Nick Carter, Master Detective -- "The Case of the Devil's Left Eye"
Nick Carter, Master Detective aired "The Devil's Left Eye" on January 4, 1948. This is only the 7th Nick Carter episode we've run since 2009, the last being this past June. Carter's history is long, covers numerous media, and is one of the more fascinating we've come upon. To crib from one of our earlier entries for new listeners, Nick Carter on radio ran a respectable twelve years, from 1943-1955, but the famous detective's history begins much earlier. During the post-Civil War era known as Reconstruction, a short story featuring Carter appeared in an obscure fiction paper (The New York Weekly) in 1886 (predating the first Sherlock Holmes story by two years). The publisher was none other than Street & Smith, a fledgling, struggling publishing firm which would later become the most dominant pulp magazine publisher in the world. Among its later titles would be Astounding Science Fiction (now Analog), the only magazine from Street & Smith to survive the pulp magazine crash of the 1950s. Award-winning radio historian Elizabeth McLeod notes that, "Within a decade, an ongoing series of Nick Carter novels vaulted [Street & Smith] to the front ranks of dime-novel publishers, and made Nick himself a national institution. Nick's own magazine, The New Nick Carter Weekly, would carry the detective into the twentieth-century." By 1915, however, the then titled Nick Carter Weekly became Street and Smith's Detective Story Magazine, a true pulp magazine and S&S's initial entry into this new format. Again, from Elizabeth McLeod: "Detective Story Weekly soon became Street and Smith's flagship publication. With the rise of radio in the 1920s, it became the firm's entree into the broadcast medium. The Street and Smith Detective Story Hour became a favorite of listeners at decade's end, with elaborate tales of murder and crime hosted by a mysterious narrator introduced only as "The Shadow." While Nick Carter himself did not appear on the program, his spirit was very much in evidence in the various detective characters that populated the stories." Of course, we all know what happened next. The mysterious voice only introducing the S&S Detective Story Hour became so popular that S&S launched The Shadow magazine in 1931, and shortly thereafter S&S added Doc Savage to its pulp adventure line. Amidst all of this activity Nick Carter was even given his own magazine (again) in 1933, proving the character's resiliency and staying power--he was now 47 years old. 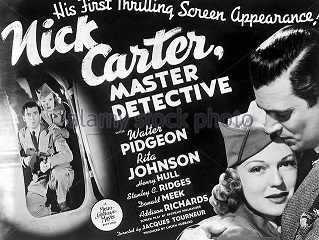 From Nick Carter's beginnings in 1886 through his final radio show in 1955, Carter would change with the times; from clean-living detective (actually, at the beginning of his career, Nick was a private investigator and consulting detective to the police department, much like Sherlock Holmes, and did not work as a police detective), master of disguise, to anti-espionage agent, to the bane of mad scientists or the defender of scientists beset by crooks, Nick Carter has enjoyed one of the longest surviving, most popular runs in various media for over 100 years, for when his radio show ended in 1955 he would resurface (yet again!) in a series of James Bond-type paperback novels in the 1960s which ran into the 1990s, quite a few of them written by women. Virtually forgotten today, Nick Carter predates Dashiell Hammett's Sam Spade, Raymond Chandler's Philip Marlowe, and was originally inspired by the real-life exploits of private investigator Allan Pinkerton. In this episode, it's a murder-puzzle worthy of Sherlock Holmes-level observation and deduction. We have a wealthy old gentleman (an antique gun collector who has also brought at great expense a whole room directly from an old Scottish castle and made it into his living quarters on the 23rd floor of a skyscraper) who has somehow been shot to death from an antique flintlock rifle while it rests firmly nestled in its display mount. Knowing the difficulties in arming and firing a three-stage weapon like a flintlock--with no one present to initiate the process, much less aim and pull the trigger--is but one of the mysteries to be solved in this ingeniously contrived murder mystery. So listen now to Nick Carter, Master Detective and "The Case of the Devil's Left Eye." And though this episode is as much SF as any Sherlock Holmes adventure (i.e. not much), one of the show's sponsors has a product with a decidedly pulpish SF sounding name (which is chuckle-worthy to modern sensibilities). The sponsor is Old Dutch Cleanser and it touts its main ingredient as Seismotite. The ad pictured at right is from 1934 and this radio episode is from 1948, so it looks like Old Dutch Cleanser and Seismotite were enjoying a pretty good run. You just never know what you'll run across while listening to Old Time Radio.